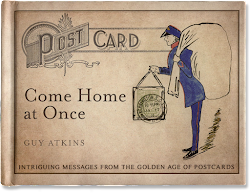 A postcard collection is never stable, never entirely complete. Ten years ago, artist Mary Anne Francis played with the challenge of ordering her collection of postcards in her work 'Unsorted'. Rather than showing an ordered collection, she exhibited her postcards in the process of being classified. I’ve come to realise that just as a collection reaches some kind of order, it seems to call out for more of a type and then, inevitably, more of a sort. Artwork sourced from Jeremy Cooper's 'Artists' Postcards', Reaktion Books.